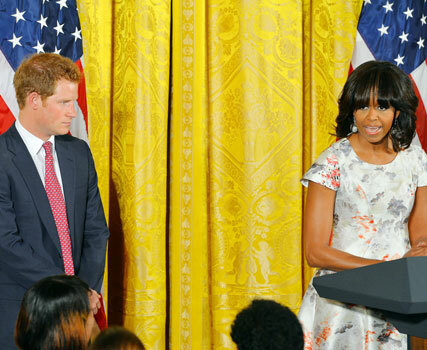 Prince Harry clearly has a way with the ladies, even Michelle Obama appeared convinced by his charms as she welcomed him to the White House on Thursday, marking the start of the royal’s six-day tour of America. The red-headed royal then spent time meeting with children and posing for pictures. Earlier in the day he continued his late mother, Princess Diana’s work with anti-landmine charity, the Halo Trust. Harry headed to a British Embassy reception to give a speech he said: ‘My mother, who believed passionately in this cause, would be proud of my association with Halo. The busy Prince didn’t stop there either he also opened an exhibition, on Washington’s Capitol Hill that promoted the charity’s work although here he was given a very large welcome but countless female onlookers.